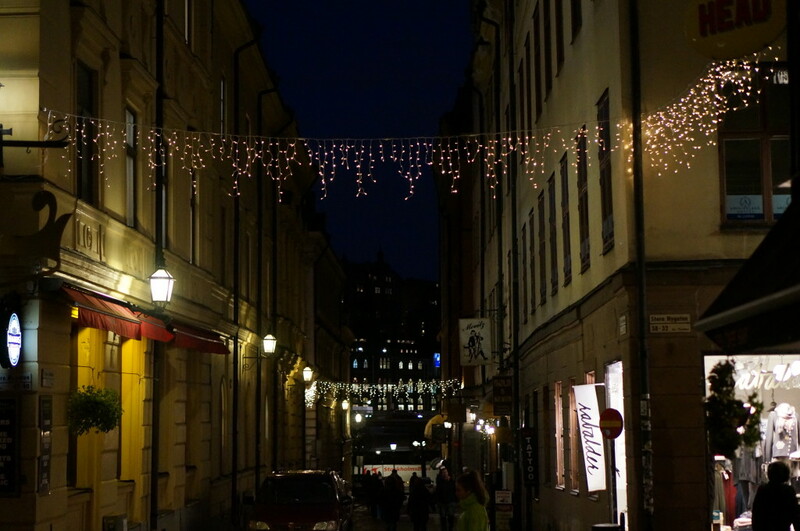 Post-Christmas Market, we Headed Back out to the Streets of Gamla Stan. This was the standard reaction I received when I announced the addition of Stockholm to my Christmas market itinerary. Ok, I sort of understood the reaction. While the allure of the midnight sun draws visitors to Sweden in the summer, I hadn’t heard many visitors mention the limited daylight and the mid-afternoon moon as a reason to visit Sweden in the winter. But I wasn’t going to let something as silly as sunshine stop me from seeing what I’d heard would be a Scandinavian wonderland and a visit to the famous Stockholm Gamla Stan Christmas Market. 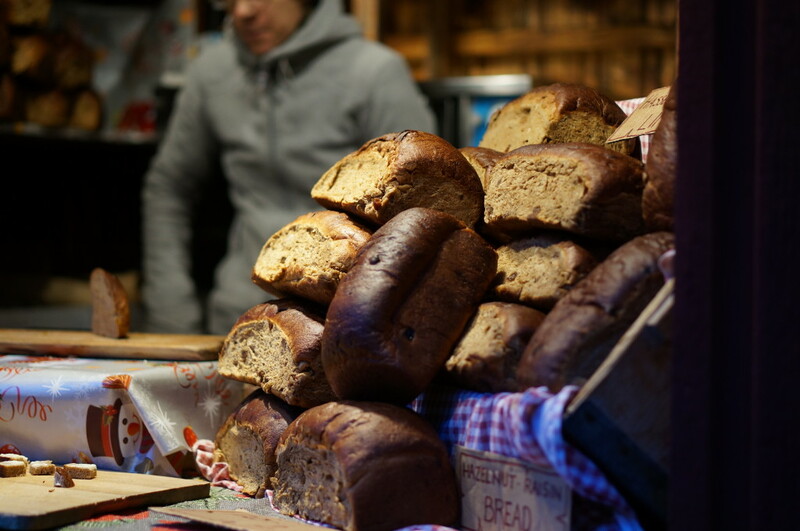 (Also check out our post on my second favorite Swedish Christmas market in the city center at Kungstradgården. 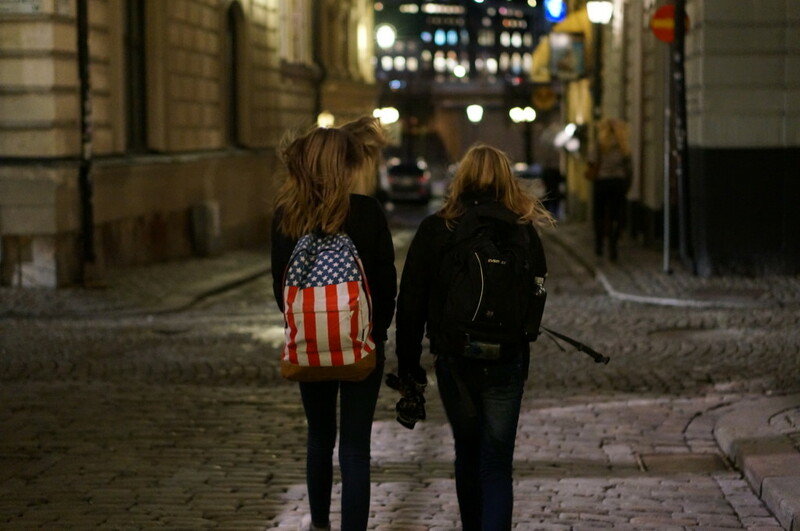 After an early afternoon arrival in Stockholm, my travel mate Linds and I dropped our bags off at the hotel and sprinted out the door, determined to beat the clock and reach the Gamla Stan Christmas market before dark. Gamla Stan, the old town of Stockholm, sat just over the bridge. The bridge to Gamla Stan, Stockholm. We hadn’t really researched when nightfall would hit and estimated between 4 and 5 pm. We were wrong. 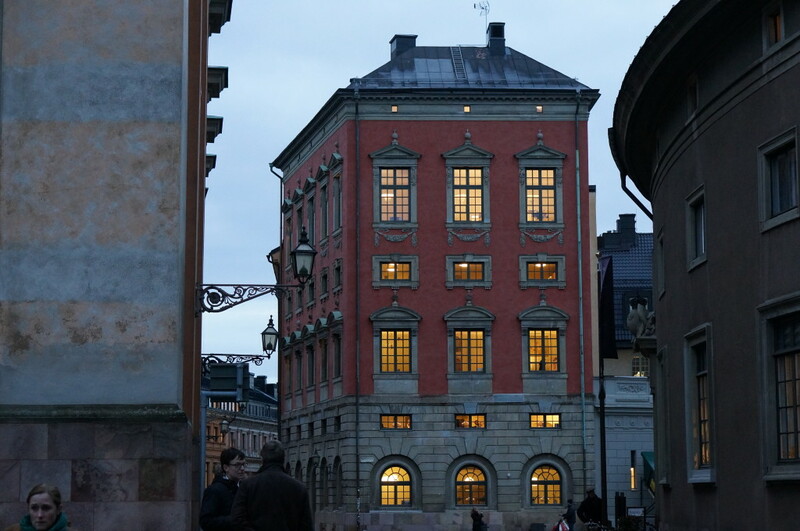 We took the quickest route to the Gamla Stan Christmas market through Stockholm’s old town. The Gamla Stan happens to be one of Europe’s best preserved medieval cities so it was impossible hard not to be distracted. I may have stopped and taken a few quick snaps. A Swedish guard in Stockholm’s old town, Gamla Stan. Stockholm, 2:30 pm. By the time we reached the Gamla Stan Christmas market, afternoon had already given way to dusk. We hurried over to the wooden cabins dotting the 13th century square. 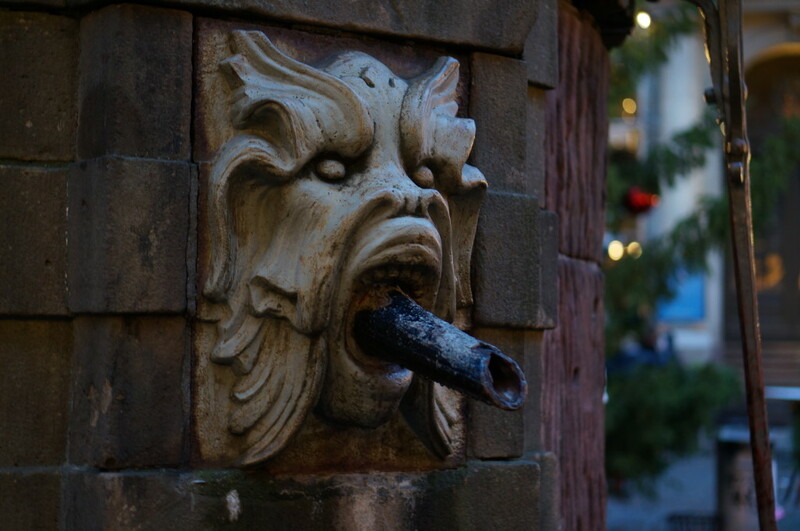 My first impression of the Gamla Stan Christmas market– had I stepped into some kind of fantastic fairytale? Not the kind with scary witches and burning stoves, but the kind with dancing woodland creatures and wish-granting fairies. Yes, it was really that magical. Rosy-cheeked Swedish children beaming at the sweets before them. 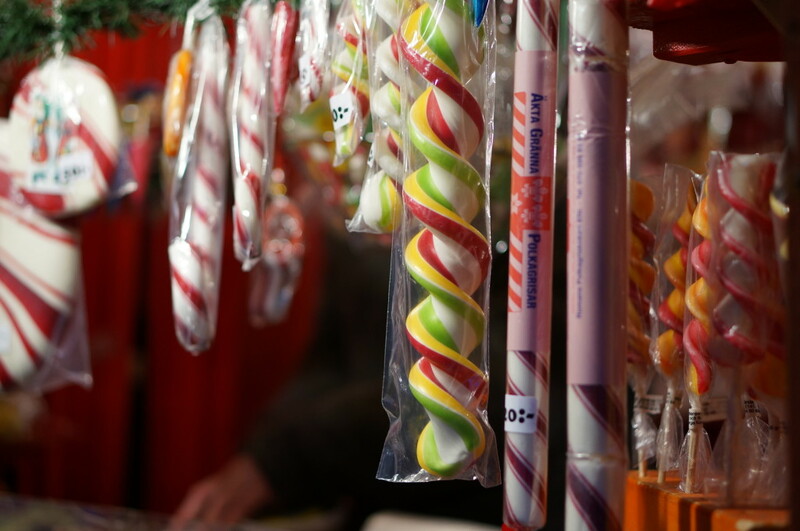 The candy cane vendor at the Gamla Stan Christmas Market. Most of the Christmas decorations had a distinctively Swedish look to them, like these bundled-up mini elves. 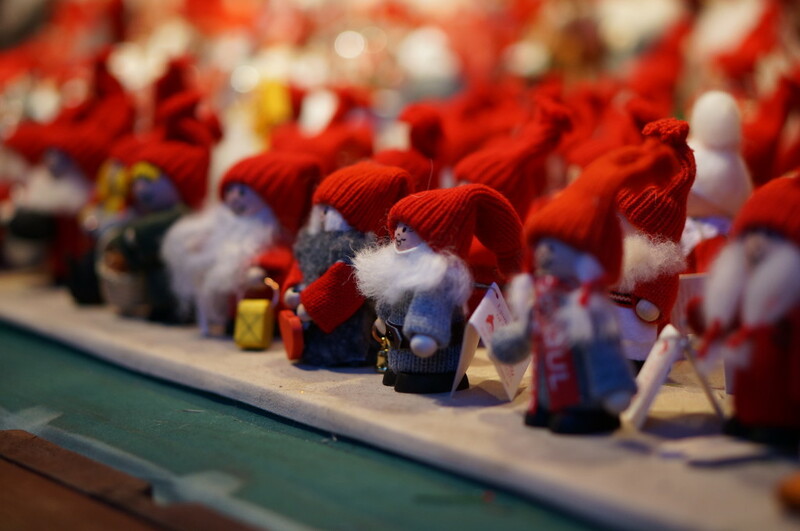 The Stockholm Christmas market featured lots of swinging elves and Santas. Red and white seemed to be a predominant color scheme for Swedish Christmas ornaments. Loved these Swedish mini ceramic white elves. My review of Stockhom’s Gamla Stan Christmas Market in Sweden. 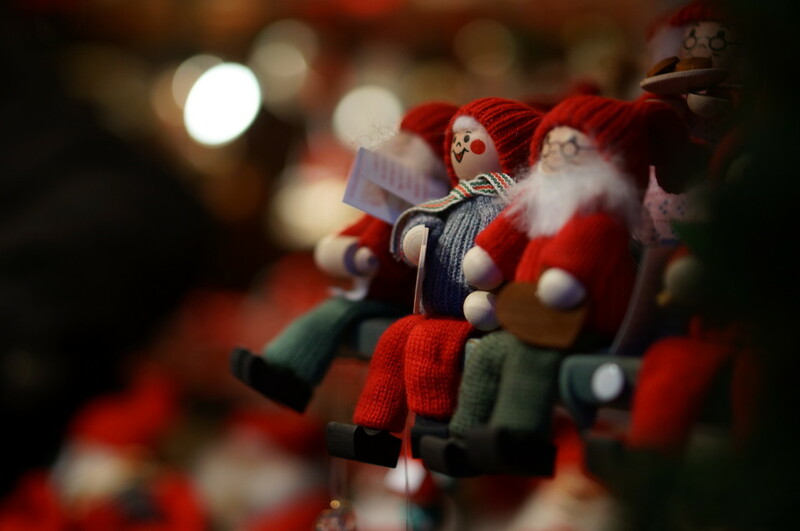 These Swedish ceramic Christmas figurines were adorable.Stockhom Christmas market reviews: Gamla Stan, Sweden. 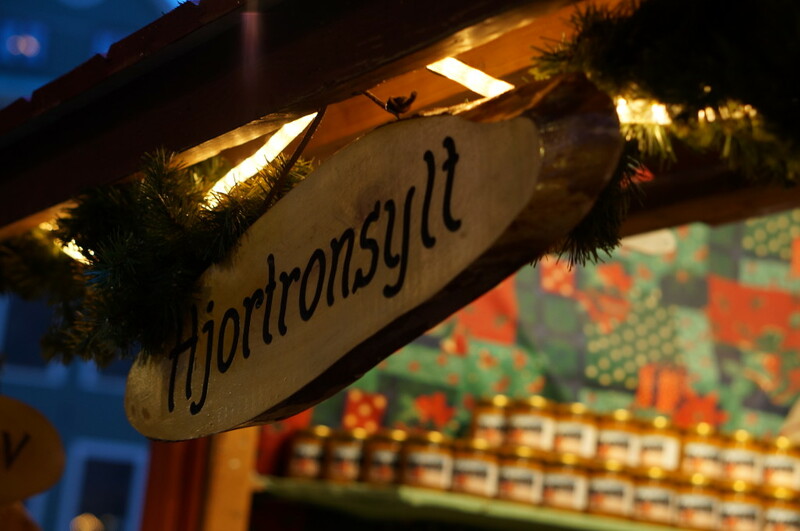 Vendors took great care into making their stalls feel festive, adding to the storybook feel of Stockholm’s Gamla Stan Christmas Market. 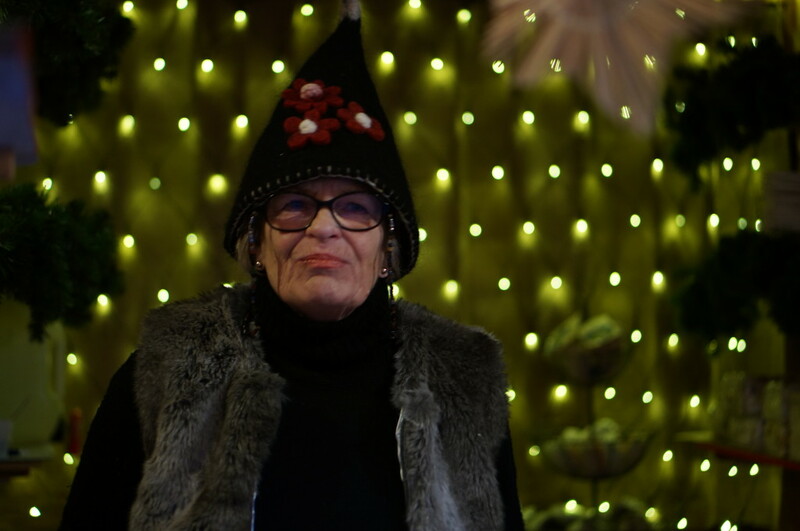 I adored this Swedish vendor’s hat as much as her delicious selection of local cheeses. 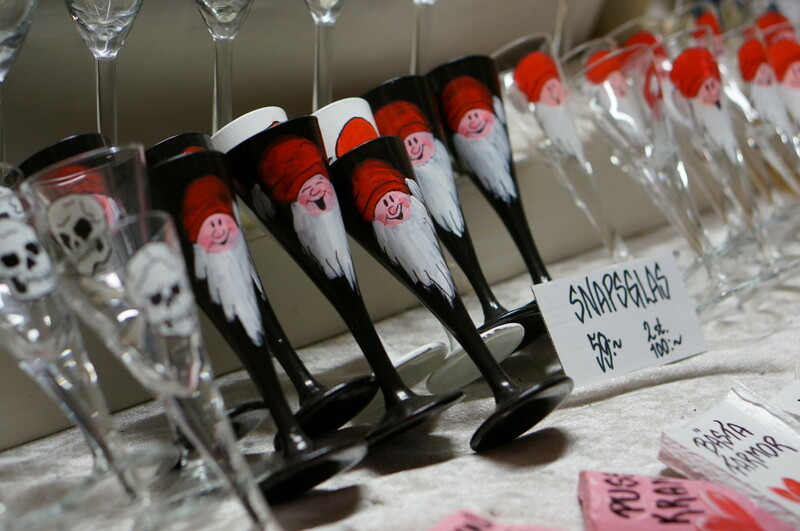 A perfect gift from the Gamla Stan Christmas market– a festive champagne flute (snapsglas) hand painted with a santa…or a skull. 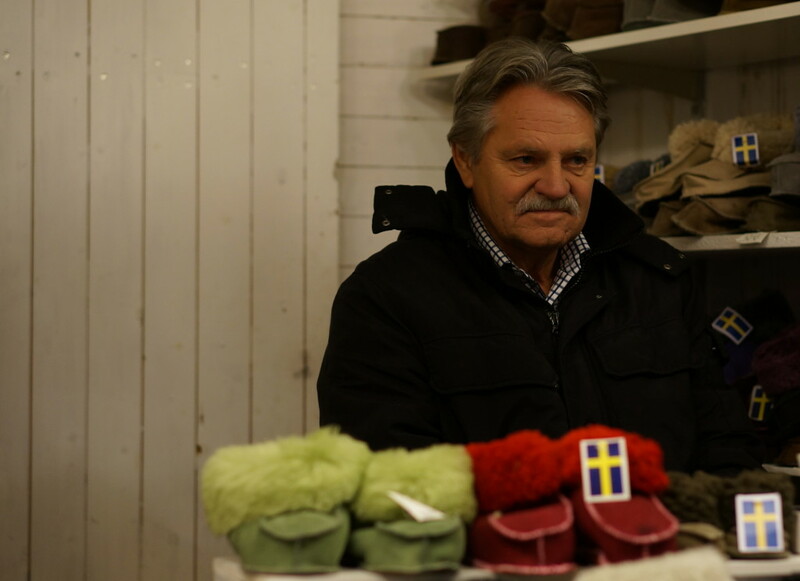 This Gamla Stan Christmas market vendor specialized in lambswool items– I loved these baby shoes decorated with Swedish flags. Sometimes you could barely see the Swedish vendors through their elaborate, carefully arranged displays of ornaments. 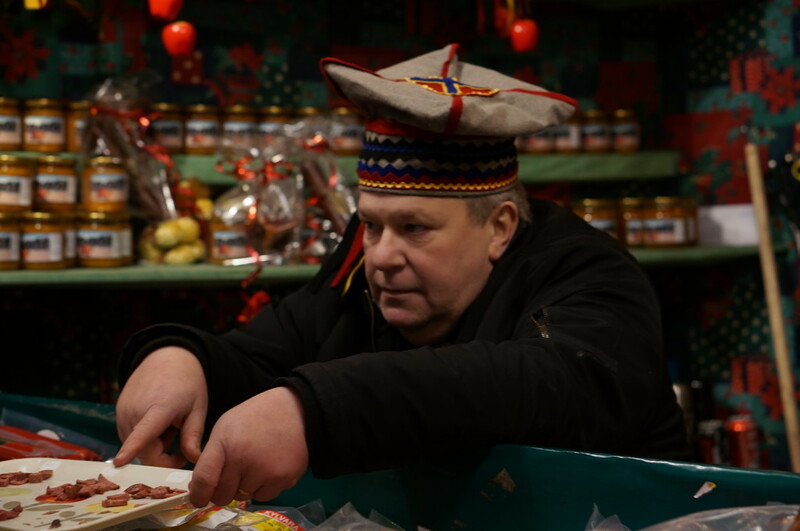 This Swedish vendor charmed us into trying smoked reindeer meat. 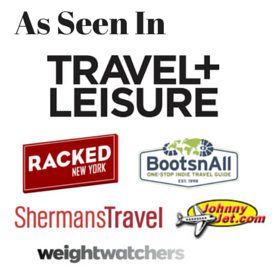 Our review? Pretty tasty! 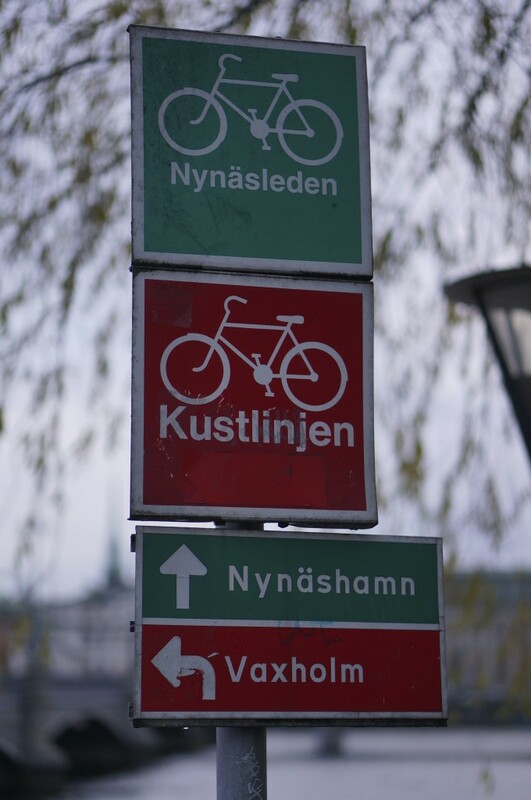 I gave up on trying to read the Swedish signs. The Swedish Glogg vendor had a brisk business on the chilly afternoon. After that it was time for some Glögg, the Swedish version of mulled wine. We checked out the Swedish baked goods and sweets. 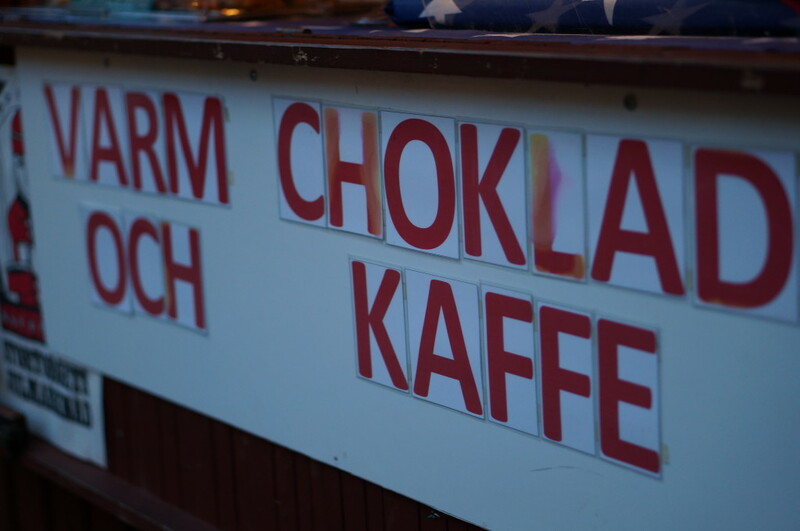 Varm Choklad (hot chocolate) at Stockholm’s Gamla Stan Christmas Market. Hot dogs are eveywhere in Sweden. Swedish hot dogs with your choice of topping at the Gamla Stan Christmas market. The only hot food option was a lone hot dog vendor. We were in the mood for something heartier so we decided to grab dinner in town instead. Pretty advent candles in numbered jars. 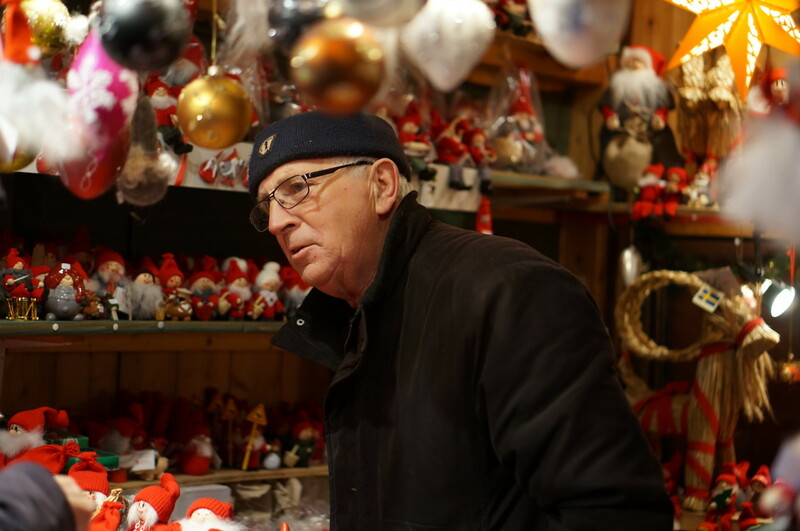 Review: Gamla Stan Christmas Market. I couldn’t get enough of these woolie figurines. By 3:30 pm, night had set on the Gamla Stan Christmas market. But instead of dampening the festive mood, it only made it even more magical. I picked up some jul-hallbroad, a thin, cracker-like bread sweetened with cinnamon and spices, to bring home with me. 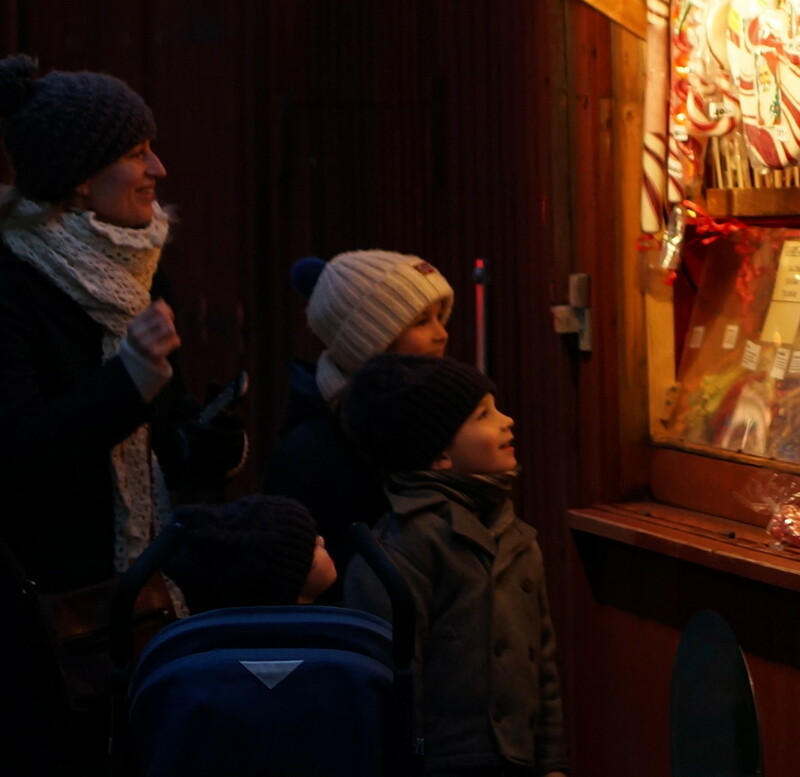 The wooden stalls lit up at night created a cozy feel at the Gamla Stan Christmas Market. 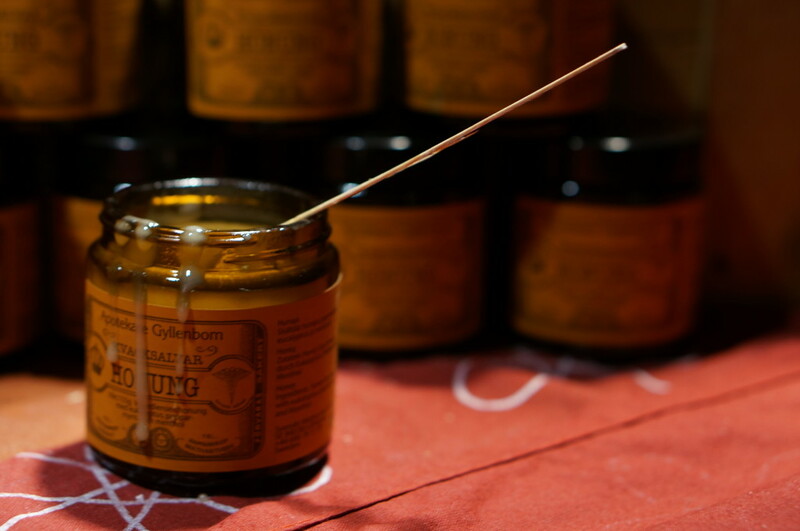 Swedish honey from a local farm looks tempting. 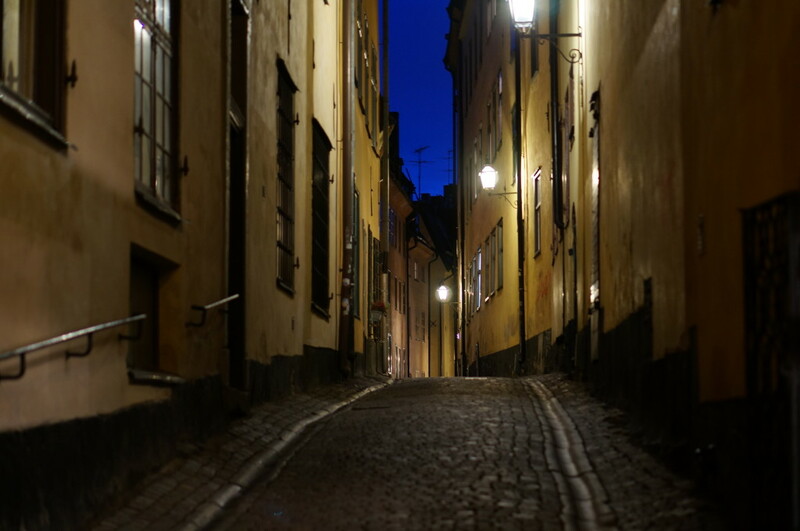 The dark skies and lantern-lit alleys gave Gamla Stan’s cobblestoned streets a luminescent quality. 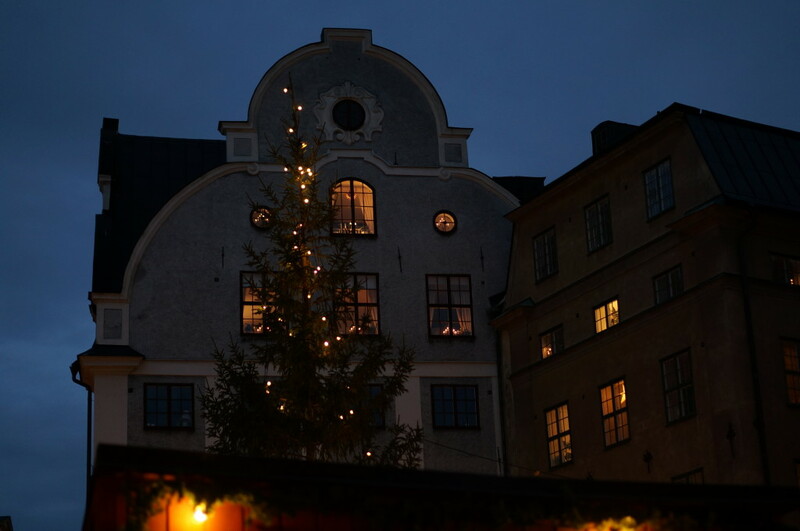 The Swedes excel at subtlety, even when it comes to their Christmas decorations. 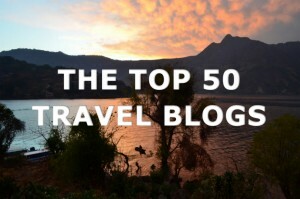 You won’t find blinking, colorful lights or giant plastic snowmen here. 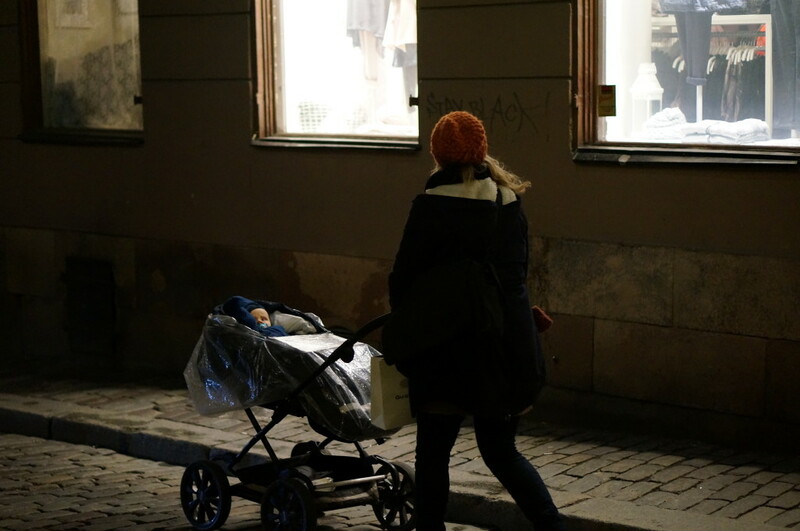 The cold and dark doesn’t stop the Swedes from going about business as usual. Looking at this photo, it’s hard to believe these tweens aren’t breaking curfew but are just on their way home from school in the mid-afternoon. 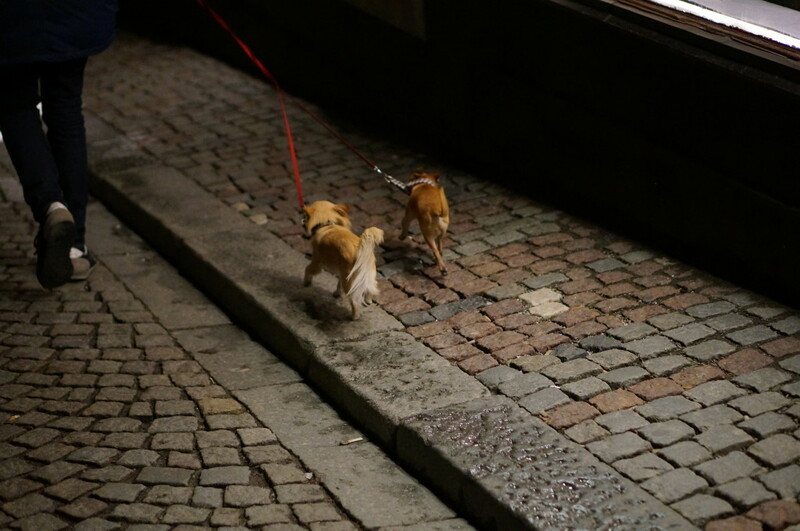 I was shocked these Swedish chihuahuas forgot to wear their coats. I’m not surprised that candles are so popular in Stockholm. 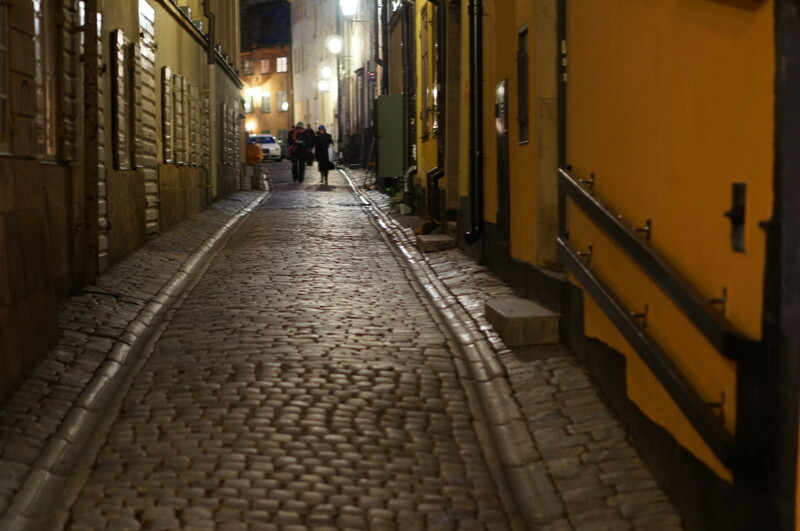 I could have wandered these ancient cobblestone lanes forever, but the frigid nordic air had started to catch up with us. Lesson learned– the next day I wore two pairs of my “thermal” socks. We stopped to admire the Christmas trees for sale before hopping onto Stockholm’s easy-to-navigate metro. Loaded with bags full of Swedish Christmas market goodies, we set off to find a warm dinner. 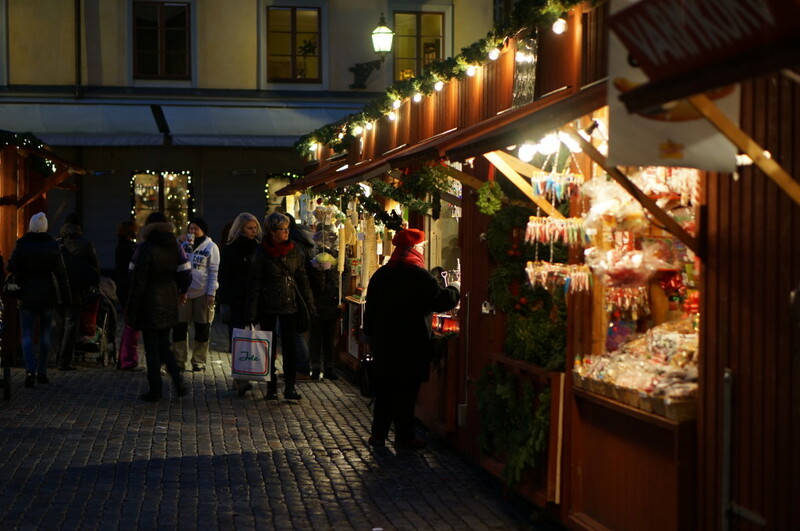 Have you shopped Stockholm’s Gamla Stan Christmas market? Share in the comments below! 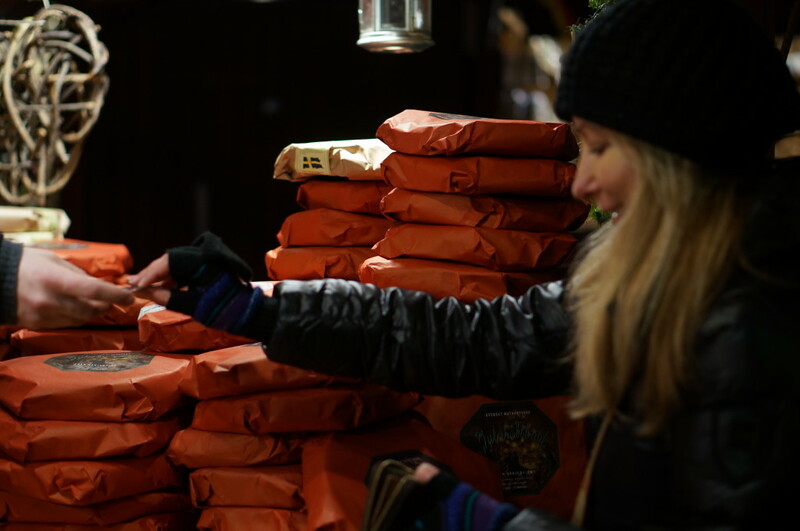 Want to read about more Christmas markets? Swedish Christmas market in the city center at Kungstradgården. 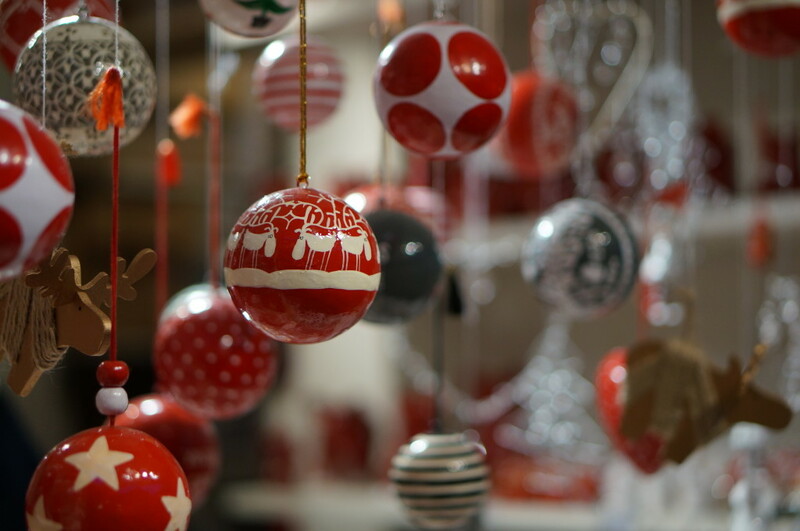 Is New York City’s Union Square Holiday Market worth checking out? 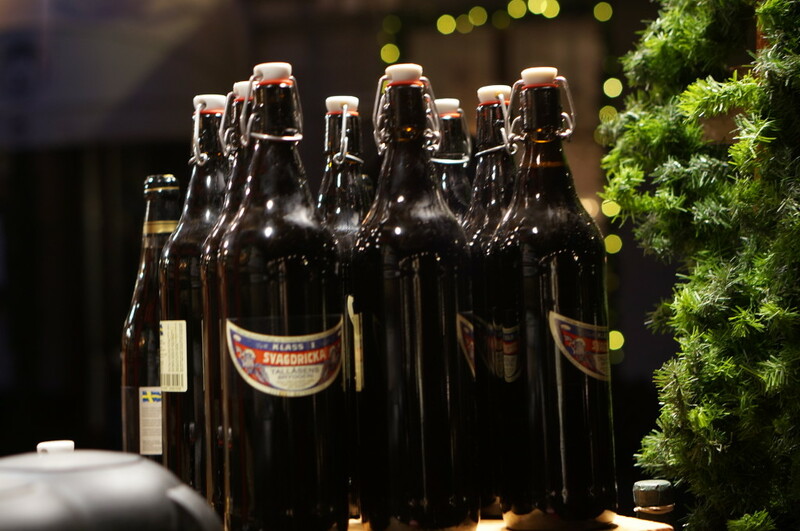 Munich, Germany’s Medieval Christmas Market: Corny or Cool? All photos Copyright 2014 by Souvenir Finder, all rights reserved and may not be used in any way without express permission. Kristin it looks like you are having a wonderful adventure, albeit in the pitch black of the afternoon! Smoked reindeer meat….best not tell Santa. Haha I was thinking how lucky for those receiving gifts from you! Unique treasures. Love the atmosphere, wish I were there! It was definitely the most transporting market of all of the countries I’ve been to! This looks like such a magical experience! Thanks Amy, it really was! Would love to go back when it’s warm though!